I love Greek yogurt, but after eating it for a snack five days a week for at least a year, I decided it needed some sprucing up. 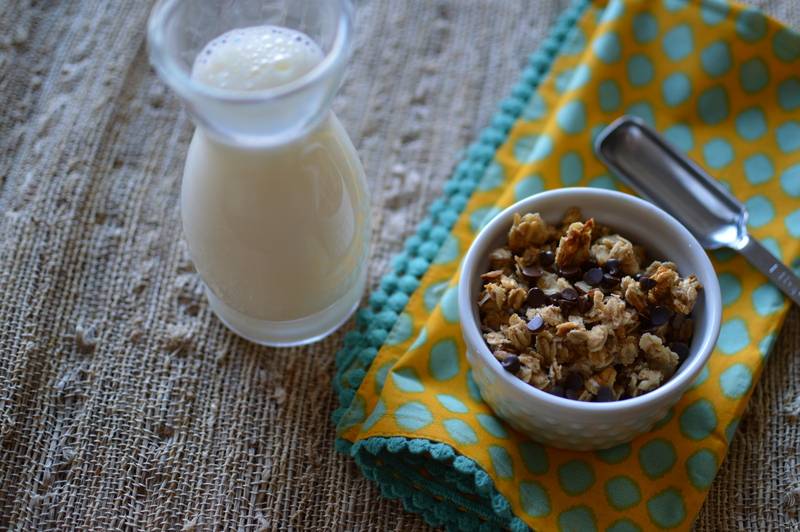 Nothing brings life to a cup of yogurt like granola! This version can be made crispy or chewy and you can make 12 servings in under an hour. Granola you buy at the store is typically high in sugar and fat, but this granola has a higher protein content thanks to the addition of whey protein isolate and lower in fat and sugar. 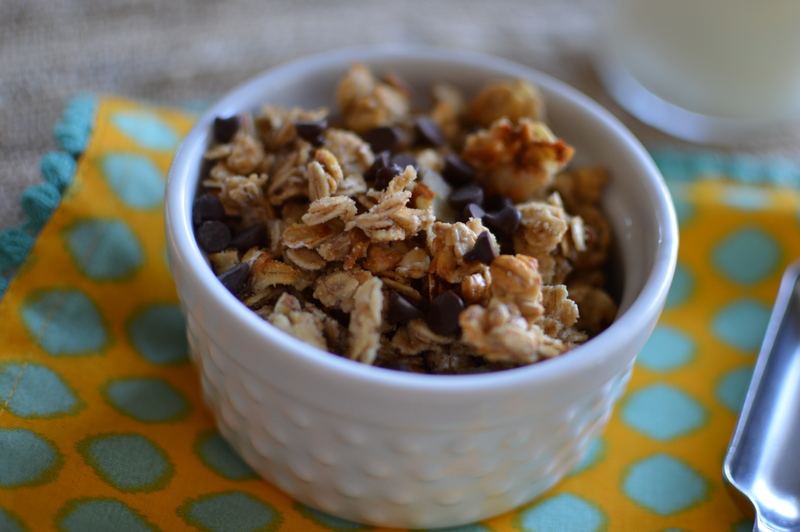 The combination of chocolate chips, toasted coconut, and roasted almonds make it taste like a candy bar! Irresistible! 1. Preheat the oven to 325 degrees. Line a large baking sheet with parchment paper and set aside. 2. Combine the oats, shredded coconut, and slivered almonds in a mixing bowl.3. Whisk together apple juice, maple syrup, coconut oil, whey protein, and salt in a small saucepan. Heat over medium, whisking occasionally, until thickened and beginning to bubble. Add the vanilla extract. 4. Pour the hot liquid over the oats and stir together with a spatula to coat evenly. Pour the sticky oat mixture onto the parchment lined baking sheet and use the spatula to spread it out evenly. 5. Bake for 30-40 minutes, stirring or flipping the oats once or twice with a spatula partway through. 6. The granola is done when it is dry (or mostly dry if you prefer a chewy granola). Allow to cool completely before adding chocolate chips. Store in an airtight container. For a different variation, try adding a dash of cinnamon, nutmeg, ginger, and ground cloves to the oats instead of coconut and dark chocolate. 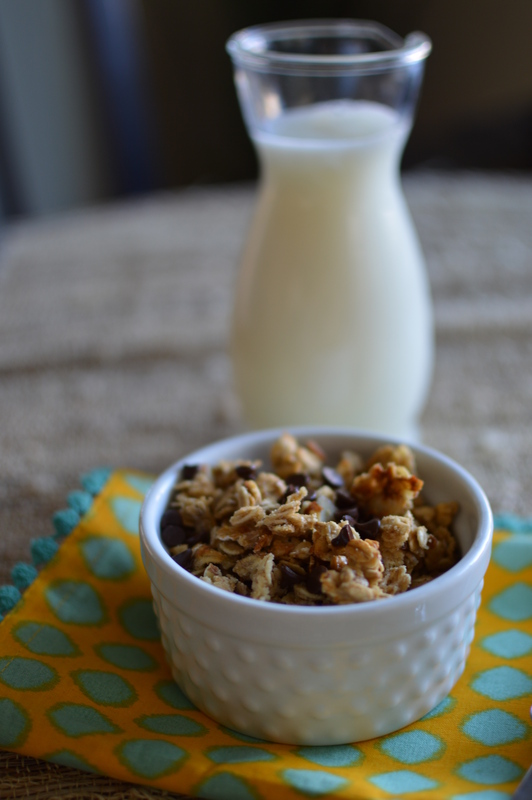 Enjoy a handful on its own, as a yogurt topper, or with your favorite cereal! Love this recipe and the use of protein powder! Thnx! I love this granola! It will be perfect for our camping trips or baseball games!